The upcoming third anniversary of the Wild Edge finds me in a reflective mood, pondering the purpose of my blog. My original reasons for starting a nature photo essay blog were trifold. To share my adventures, writing and photography with friends and family. To share the joy and solace I find in nature. To inspire readers to take notice of the natural world around them. We humans share our planet with billions of other living things. How many of us pay attention to this? How many of us live from daybreak to dark only seeing the roads, the traffic, the office building, or the inside of our home? Outside there is a world of creatures going about their family lives right under our noses. In our backyards, in the schoolyards and playgrounds, even in the strips of grass and shrubs that border our parking lots. 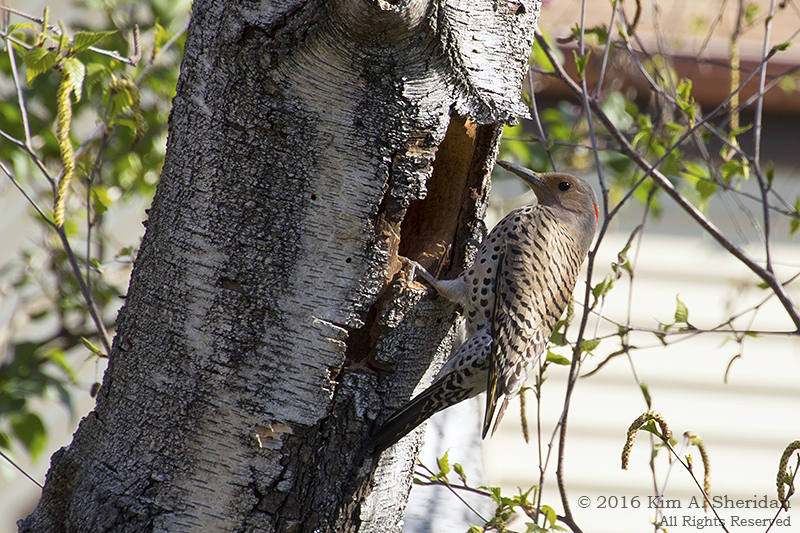 Like the Northern Flicker couple starting a new home in my backyard. 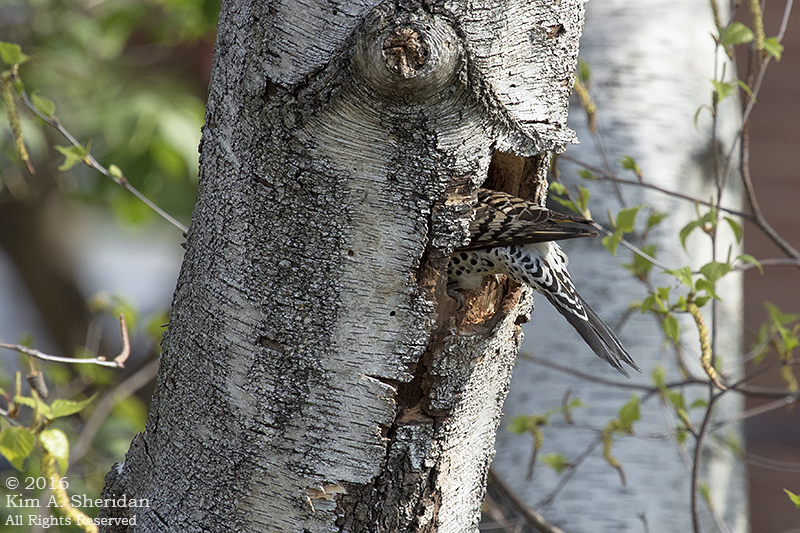 They’ve decided that a decaying trunk of my old gray birch tree is the perfect place to build a nest. They’ve been working hard for more than a week, excavating and enlarging the cavity. 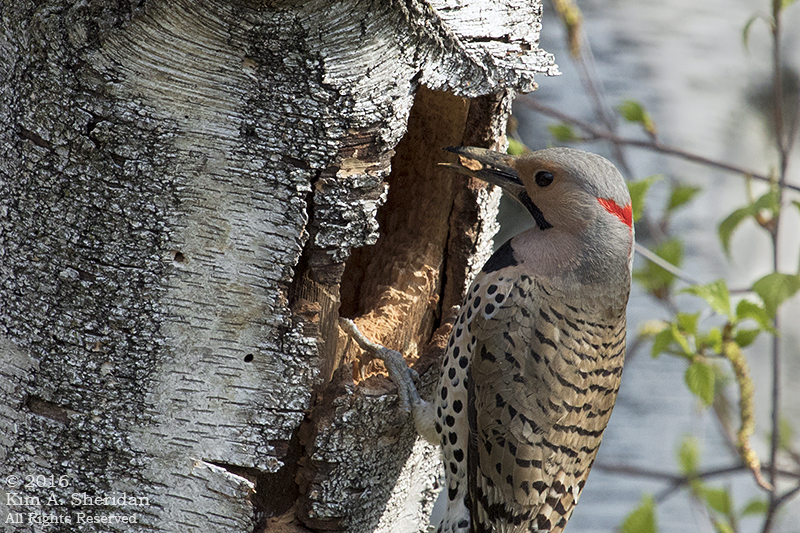 Like all woodpeckers, Flickers have large sturdy beaks for drilling into wood. Not for food, though. They prefer ants and beetles found on the ground, which they often reach by drilling into the soil. 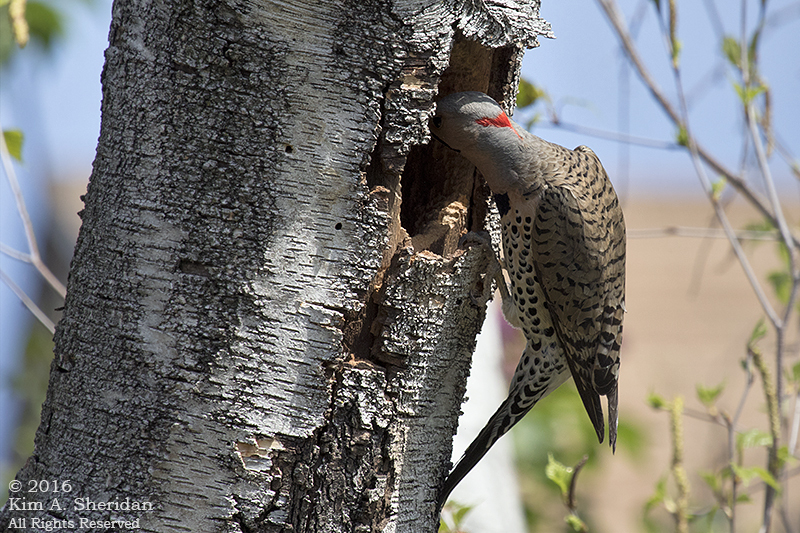 Papa Flicker nearly disappears as he reaches deep into the hole to do a little housekeeping. …And shakes his head vigorously, tossing wood and sawdust in every direction. 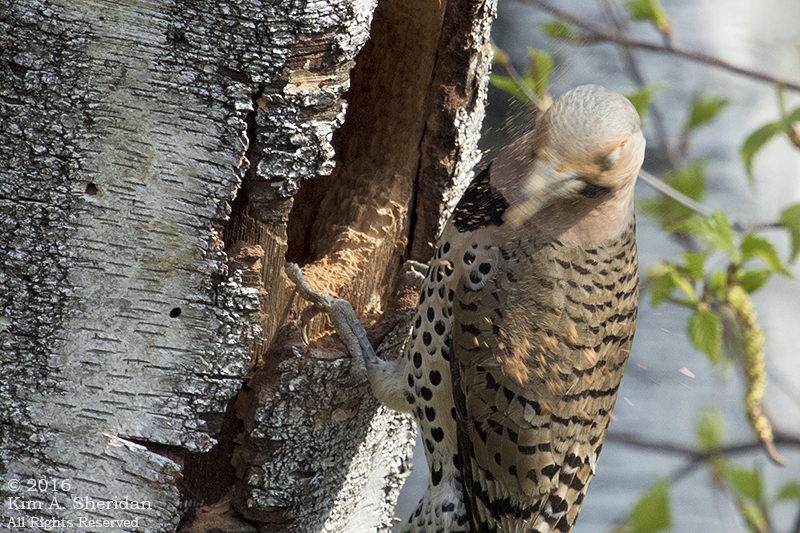 That tiny bit gone, he disappears again to dig out more wood from the inside of the cavity, then tosses it away from the tree. Over and over and over again. Building a snug home is hard work. 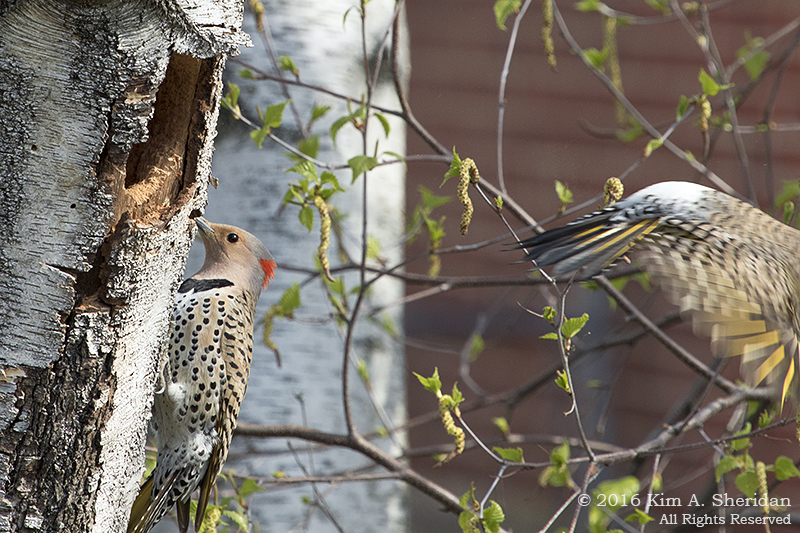 Mama Flicker arrives to take the next construction shift. She perches behind Papa, waiting her turn. …And flies off. 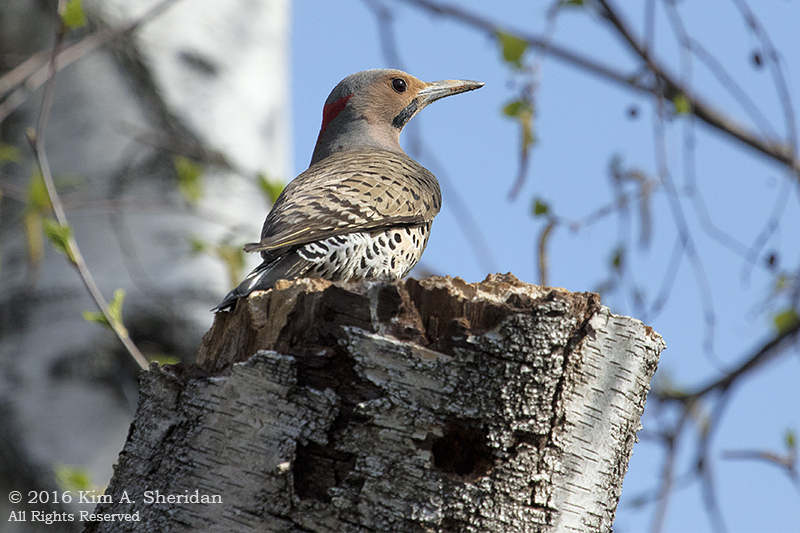 Northern Flickers were once thought to be two species. 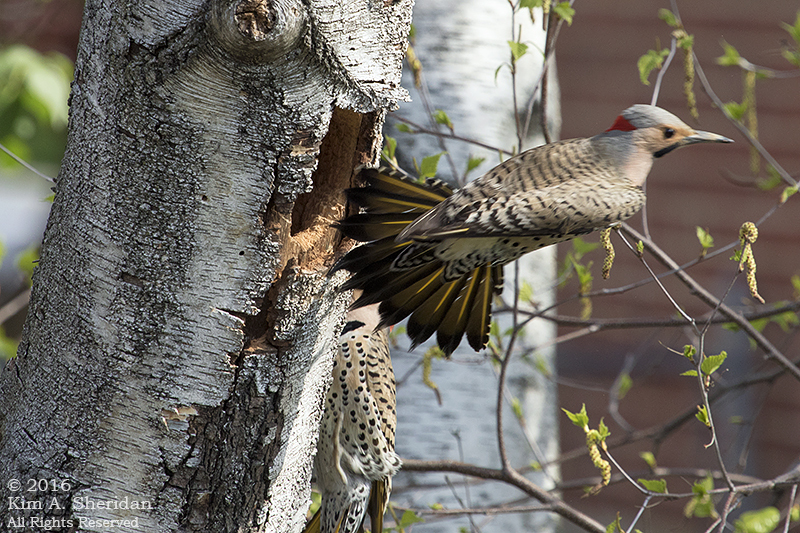 The eastern birds were called Yellow-shafted Flickers, because the feathers of their tails and wings have yellow shafts. 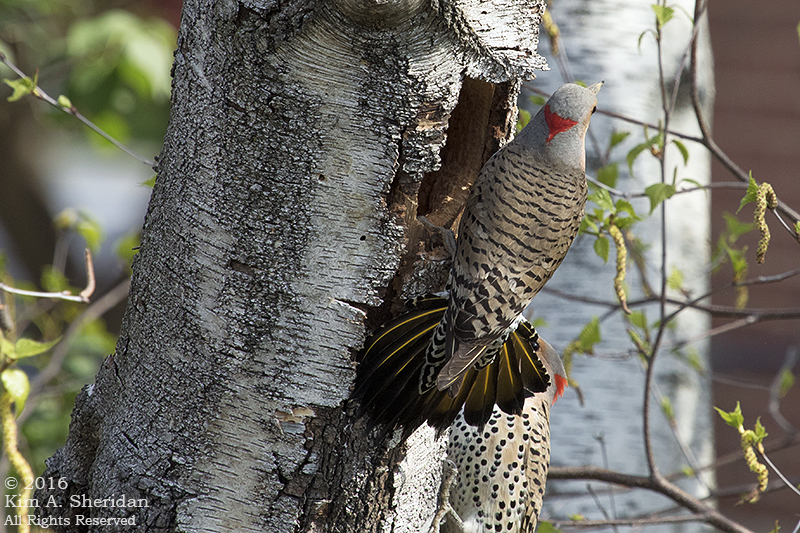 The feathers of western Flickers have red shafts. The yellow shafts are easy to see here, though the bird is a blur of motion. 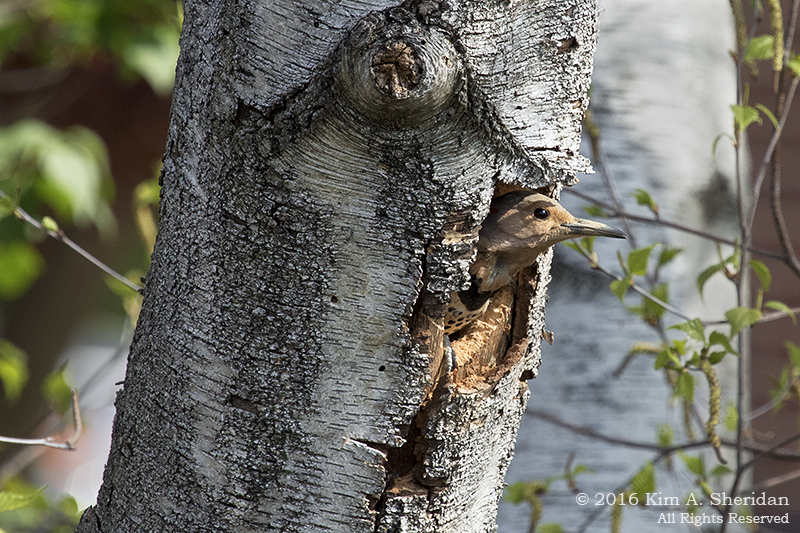 Mama Flicker approves of her new home. Soon there will be eggs, and then babies. And I will have a front row seat to watch them grow up. Right in my backyard. Right at the Wild Edge. What’s going on in your backyard?